Early morning - and Jamie’s just getting home? This episode hit the ground running right along with him, and didn’t slow down. We know immediately (due to Claire’s bigger baby bump) that more time has passed...and that something’s not quite right on the home-front. Jamie is so busy he doesn’t even have time to sleep: spending his nights in the brothel trying to glean information from Prince Charles and his days at Versailles gaining the trust of M. Duvernay, the Minister of Finance. Charles is pushing Jamie for an introduction to Duvernay in order to obtain King Louis’ support for his rebellion - while Jamie needs Duvernay to dissuade Charles from such a notion - without asking too many questions, of course. And… let’s not forget, Jamie still has the wine business to run. Jamie appears to be handling it all admirably. Breezing in and out of the house at dawn, it’s obvious that this has become routine: in a couple of clever camera shots that follow Jamie continuously from room to room, the servants perform a choreographed ballet as they silently change his clothes, give him a fortifying drink, and return his belt, sporran and dirk in just 3 minutes. Meanwhile, Jamie does his part (as a typical eighteenth century husband would) to remember that Claire has her daily tea to attend, acknowledges how well she runs the household, and even offers his best to “her” ladies. Perfect, right? Ah...no. Jamie is very close to the breaking point - and Claire’s already reached it. But instead of communicating, each is putting on a brave face for the other. Our modern woman has been reduced to a tedious social life of tea and gossip - after all, maybe “today will be the day” she finds out something vital. And, in an amusing scene where she realises she’ll have to give shy, naive Mary Hawkins the ‘birds and the bees’ talk, Claire actually does find something out. With the aid of the flashback I was expecting last week, Claire realises who Mary is (or will be): the wife of Frank’s ancestor. So now Claire is not only bored and frustrated (in every way, according to her maid), she’s got another secret. 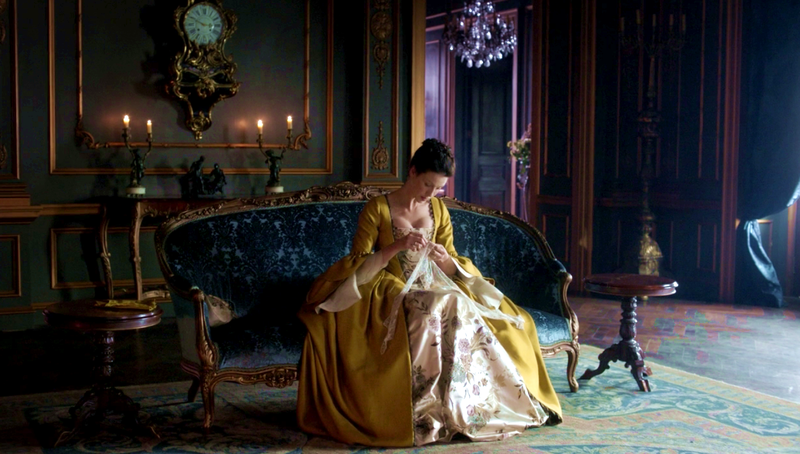 At least she finally tells Murtagh about BJR. He agrees that for Jamie to find out now would do more harm than good. And: Yay Murtagh! It’s about time that man had a little fun, especially - as he points out - he has nothing much else to do. What happened to “where he goes, I go”? Did Jamie ditch him? Exhilarated, Claire returns home to share her triumph with Jamie who – as it turns out - is not in the mood to hear it. He’s had to endure another meeting with Prince Loony - who’s so up his own arse that when he announces he has the money for a war, he thinks the horror on Jamie’s face is relief. Jamie goes home to discuss it with Claire - who isn’t there, and as the hours tick by, his anger ticks up. So when Claire finally arrives, he accuses her of “indulging herself”. Suddenly, the all the little threads in this relationship are starting to get pulled. Hard. There’s no fighting, not really. Just frustration - a lot of it - on both sides, and it’s all rather sad. After drowning his sorrows back at the brothel, Jamie ‘acquires’ a young pickpocket: Fergus. When he explains his plan to Claire, she agrees it’s a good one...but the atmosphere between them remains strained. It’s not until Jamie has to seek the help of Mother Hildegarde (with a code written in music), that the thaw begins. Jamie sees Claire at work, appreciates how quickly she supports his request...and the viewer can easily see his love and pride showing through as he watches her discuss Bach with the nun. It gets even better at home, as they work together to decipher the code. They realise that the Duke of Sandringham (and Dougal!) are probably involved. And if Jamie’s going to see the Duke, he could find out about Black Jack being alive, so Claire had better tell him first. She steels herself as Jamie raises a toast to Mother Hildegarde, and “to my wife who is always there when I need her”. Basically an olive branch, an apology for his behaviour. She’s still going to tell him...but then he calls her Sassenach. Jamie smiles. Claire crumbles. Murtagh glowers. This relationship isn’t mended yet, nowhere near.